The most versatile VR gaming PC yet? The new HP Omen X is an awfully impressive VR gaming PC that brings an incredibly clever approach to the table. However, it also costs a small fortune to get in on the ground floor, making it a tough sell for most. Until someone figures out lag-free, wireless virtual reality (VR) from a PC or develops an standalone headset that can match PC-grade VR, we’re going to be stuck with backpack PCs. Knowing this, HP has gone and crafted arguably the most impressive one yet: its new HP Omen X Compact Desktop. First seen around this time last year in a prototype state, to call this simply a backpack PC would be a sore oversight, as this PC doubles as both a powerful compact gaming PC that stands vertically on an included dock and one that can be strapped to your back for tether-free VR with an HTC Vive. In a way, it’s a Nintendo Switch-like concept that could see PC gamers moving their prospective Omen X throughout the house, between their desk, their TV and on their back in between. Frankly, it’s mighty impressive, despite not getting to test its VR performance during a recent preview event held by HP in New York City. HP is positioning the Omen X as a one-stop shop of a gaming PC, what with its versatile use cases and diminutive size. So, it shouldn’t come as a huge surprise that this is an expensive rig, but $2,499 (£2,499, about AU$3,340)? Wait, that’s not all: HP’s looking to charge a whopping $599 (likely £599, about AU$800, but not confirmed) for the backpack accessory that makes its compact gaming PC-meets-mobile PC VR device concept possible. The price gets you the backpack straps, the vertical stand dock for easy switching between modes and four lithium ion batteries that can be hot-swapped for limitless VR time, thanks to a 50Whr battery within the PC itself. Getting into what else is inside in a moment, you’ll be able to pick up an HP Omen X in the US and Europe starting this July from HP’s own website. Not a ton has changed about the Omen X design since we last saw it as a prototype, if only refined. More hard angles are found throughout the device’s shell, and the Omen brand logo now illuminates in crimson red between a similar crossing of red LED strips. The backpack accessory design doesn’t seem to have changed one bit, with easy-to-use battery pockets on each side of the shoulder straps, though positioned at the waist. The result is easier battery swaps that can be done with the PC still strapped in. Atop the PC, you’ll find two standard USB 3.1 ports, an HDMI port, a DisplayPort and a USB-C port with Thunderbolt 3. The bottom of the PC houses a proprietary multi-pin data port beset on both sides by round, mutli-pin power ports. This is how HP’s Omen X dock, the newest wrinkle to the firm’s mobile PC VR strategy, accepts the Omen X PC vertically. Of course, the dock offers up additional ports, namely two USB 3.1 ports and one USB-C port with Thunderbolt 3 in the front, and in the rear a bevy of ports that match that of what’s on offer atop the PC itself. All told, it’s a rather elegant solution, able to switch between docked and backpack modes seamlessly, thanks to a 50Whr internal battery that can carry the PC for those brief moments spent switching between the two. HP has outfitted the Omen X with a “factory-overclocked” mobile-grade Nvidia GTX 1080, which HP promises can provide fluid gaming at 4K resolution as well as in VR. Backing up that graphics card is a series of available mobile-grade Intel Core i7 processors (Kaby Lake) that, thanks to HP’s thermal design, can be overclocked at home for higher frequencies. The system will also house 16GB of RAM, though the firm has remained tight-lipped on what type of storage and how much of it the Omen X will contain, for some reason. While we weren’t able to test out this version of the Omen X’s VR performance, our testing of last year’s prototype on likely previous-generation hardware inside was so smooth that we have little worry of how well this shelf-ready revision will handle it. That said, we did get to try the thing on. 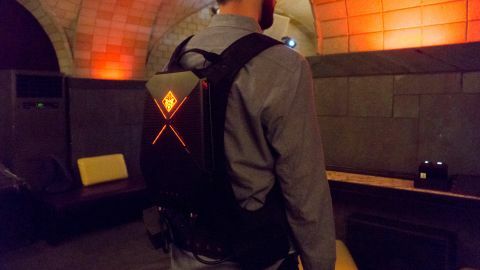 HP hasn’t made any mention of exactly how heavy the Omen X is, but it feels far less hefty than the backpack we take into the TechRadar offices, so that’s a fine start. Strapping on the PC with the backpack accessory is easy enough, and it’s well-cushioned for comfort. Better yet, the plate upon which the Omen X fits onto is angled from the bottom to the top slightly away from the body, helping prevent heat transfer. Coupled with HP’s ‘advanced thermal engineering’ that draws cool air in from its shell and spews hot air out its side vents, we couldn’t feel much – if any – heat emitted from the device while wearing it for about 5 minutes. Granted, the Omen X wasn’t enduring a full load of pushing VR content, but it was definitely powered on and dispensing heat as we wore the device. Just like we said before, the only factor we could see contributing to wanting out of the experience is the weight of the HTC Vive headset, not this device. As for how long it will last on your back before having to swap in two more batteries, HP rates the Omen X to last for 90 minutes in most games. Hence why it comes with four batteries, so that you can charge while you play and continuously swap if need be. The new HP Omen X is an awfully impressive VR gaming PC, with the ability to jump between docked and backpack use cases seamlessly. This type of versatile gameplay is something that many thought would be a hard sell for Nintendo this year, to which they’ve been proven wrong. However, that versatile gameplay conceit costs 300 bucks, while this one costs more than three grand before you even consider the cost of an HTC Vive. So, despite the Omen X being arguably the most sophisticated VR gaming PC to date, that price tag is going to be nigh-impossible to swing for most. In the end, no amount of ingenuity and clever design can overcome that asking price. Nevertheless, we’re very much impressed with how the Omen X has come along, and are excited to put it through its paces in a full review.